UPDATED: Sun., April 14, 2019, 10:33 p.m. When the 2018-19 season started, the Spokane Chiefs were a trendy pick in the Western Hockey League’s U.S. Division. The Chiefs even started the season in the Canadian Hockey League’s top-10 rankings. But a tough division, coupled with an incomplete lineup the first half of the season, meant the Chiefs were continuously jockeying for position in the U.S. Division. 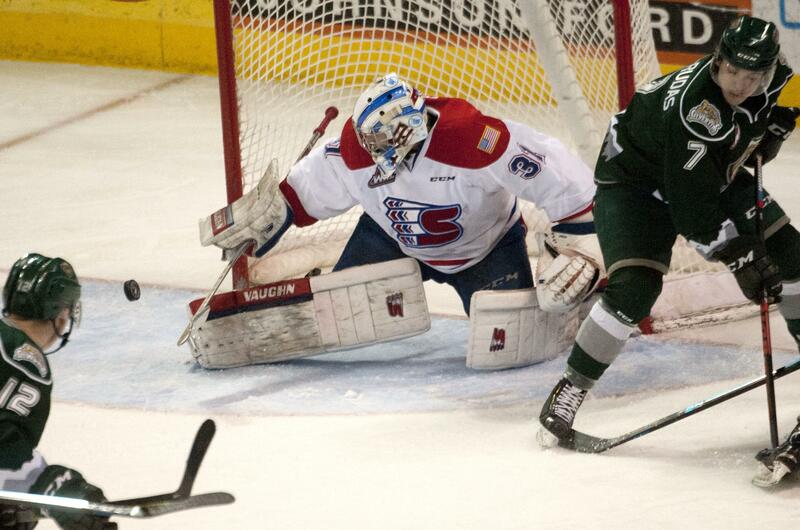 Plus, the Everett Silvertips were busy running away with the U.S. Division crown. But the Chiefs eliminated the Silvertips on Saturday night in five games and now find themselves in the Western Conference final. The Chiefs will face the Vancouver Giants starting Friday in Langley, British Columbia. Vancouver is the top seed in the West. The Chiefs ended the regular season healthy and were playing their best hockey. It showed in a five-game first-round series win over the Portland Winterhawks and an intense five-game series win over the Silvertips. The Chiefs used their scoring depth to beat Portland and relied heavily on their defense to beat Everett. Against Vancouver? Time will tell, but it’s clear the Chiefs can adapt and buy in to a winning formula. “It feels pretty good to have a group like that,” Chiefs defenseman Ty Smith said after eliminating Everett. The Chiefs won one of four games against Vancouver during the regular season, and that came on March 8 in a comfortable 4-1 victory. The Giants enter the series having beaten the Seattle Thunderbirds in six games and the Victoria Royals in four. The Giants have used two goalies during the playoffs, relying on both Trent Miner and David Tendeck in net. Both Miner and Tendeck have appeared in five games and have nearly identical save percentages. Miner has a slight edge in that category at .915, while Tendeck comes in at .912. The Chiefs have relied solely on Bailey Brkin, and it has paid off. Brkin, who is second to Prince Albert’s Ian Scott during the playoffs with a .931 save percentage, has come up huge when the Chiefs needed it most. That included Saturday night’s clincher over Everett. Brkin and the Chiefs lost a frustrating 4-1 decision the night before, and Brkin decided to get his mind right. The Giants have a potential top-5 NHL draft pick in defenseman Bowen Byram. He has four goals and nine assists in 10 playoff games and is one of three Giants with 10 points or more in the playoffs. The others include Davis Koch (2 goals, 12 assists) and Tristen Nielsen (3 goals, 7 assists). Jadon Joseph leads Vancouver in postseason goals with six. On the Chiefs’ side, Riley Woods (6 goals, 5 assists) is the dependable scorer along with Jaret Anderson-Dolan (3 goals, 7 assists). Both teams have plenty of scoring depth, and both have a potent power play. The Chiefs are converting a playoff-best 48% of their power-play chances, while Vancouver sits second in the playoffs with a 33.3% conversion rate. The Chiefs will have an edge with the man advantage, though, as Vancouver’s penalty kill is just 11th in the league during the playoffs. The Giants have been shorthanded 37 times and have allowed nine goals. The Chiefs have only allowed two power-play goals in the playoffs. The Chiefs had the luxury of home-ice advantage in the first round and a schedule quirk in the second round that gave them three straight home games despite being the lower seed. They won’t have any of that luxury against Vancouver, as the Giants hold home-ice advantage with no schedule quirks. The Chiefs and Giants get things going in Langley, B.C, with games on Friday and Saturday. Games 3 and 4 are in Spokane on April 23 and 24. Published: April 14, 2019, 5:50 p.m. Updated: April 14, 2019, 10:33 p.m.